This section provides an overview of what asp.net-web-api2 is, and why a developer might want to use it. It should also mention any large subjects within asp.net-web-api2, and link out to the related topics. Since the Documentation for asp.net-web-api2 is new, you may need to create initial versions of those related topics. We are going to create a new Web Api simple application which return to us Json with message and user name. 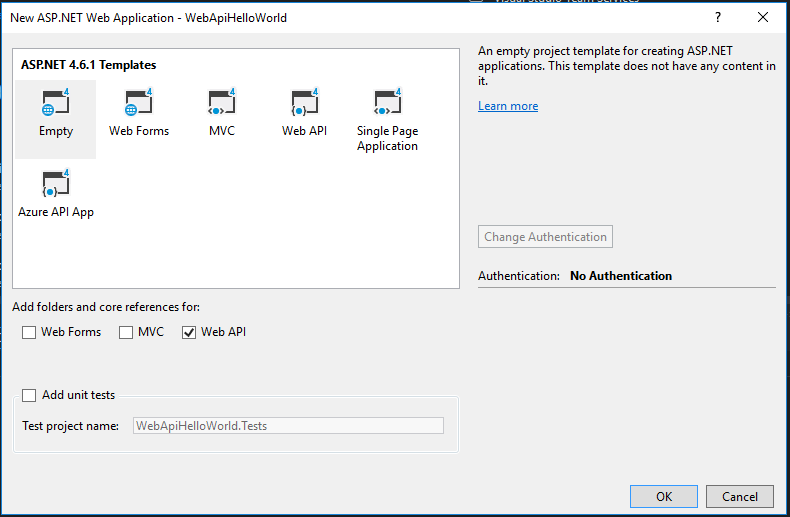 NOTE I didn't choose "Web Api" template because it adds reference to ASP.NET MVC to provide API Help Page. And in such basic application we don't really need it. A model is an C# class that represents some data in our app. ASP.NET Web API is able to automatically serialize model to JSON, XML, or some other format (depends on configuration). In our application we will create only one model, but real-world apps usually have a lot of them. A controller handles HTTP requests. Our app needs only one controller that returns Json with Hello message and user name (which we will pass in URL). In Solution Explorer, right-click the Controllers folder. Next select Add and then select Controller. 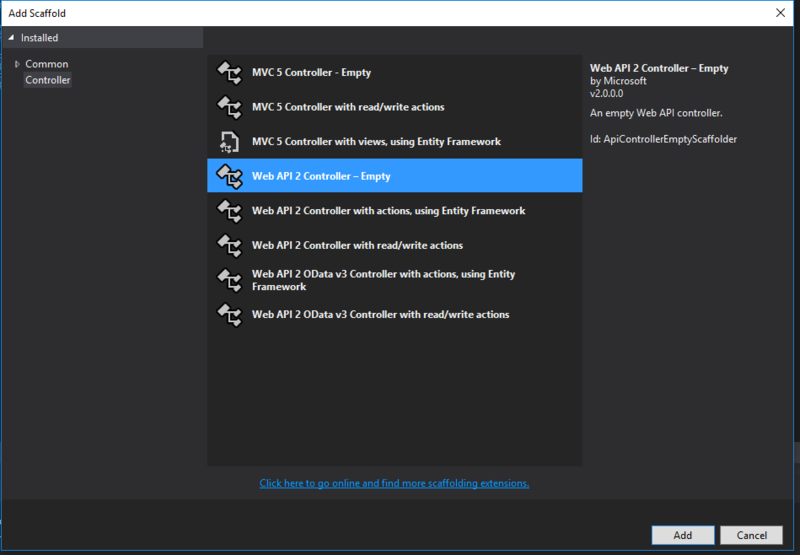 In the opened window, select Web API Controller - Empty and click Add. Set controller name as "HelloController". Next edit code of created controller. We need to add method which returns Hello message. NOTE Be sure to add using WebApiHelloWorld.Models . Without it your controller won't find HelloMessage class. Detailed instructions on getting asp.net-web-api 2 set up or installed. What and why Asp.Net Web API2? Asp.Net’s Web API2 is the latest version of Web API. It is an easy way to implement a RESTful web service using all of the goodness that the Asp.Net framework provides. Once you understand the basic principles of REST, then a Asp.net Web API2 will be very easy to implement. Web API2 is built on Asp.Net’s modular, pluggable pipeline model. This means that when a server hosting a web API2 receives a request, it passes through Asp.Nets request pipeline first. This enables you to easily add your own modules if you find that the default capabilities are not enough for your needs. With the recent announcements on ASP.net vNext this also means you can potentially host your Web API2 outside of Windows Server which opens up a whole range of usage cases. See here for detail. Web API2 uses the Controller and Action concepts from MVC. Resources are mapped directly to controllers; you would typically have a different controller for each of your main data entities (Product, Person, Order etc). Web API2 uses the Asp.Net routing engine to map URLs to controllers. Typically, APIs are held within a /api/ route which helps to distinguish API controllers from other non-API in the same website. There are many great hidden benefits to using Web API which you may not realise but actually save you a lot of work. Web API2 is setup by default to provide responses in either XML or JSON (JSON is default). However, as a developer you do not need to do any conversion or parsing – you simply return a strongly typed object and Web API2 will convert it to XML or JSON and return it to the calling client, this is a process called Content Negotiation. This is an example of a GET action which returns a strongly typed Product object. // Do something with the product (not shown).